During the Easter break, the Boyfriend and I decided to head down to Mornington Peninsula for a short, relaxing weekend getaway. 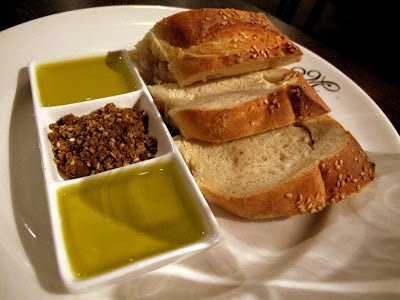 And of course, being the foodie that I am, the first thing I did was to look up places to dine at. 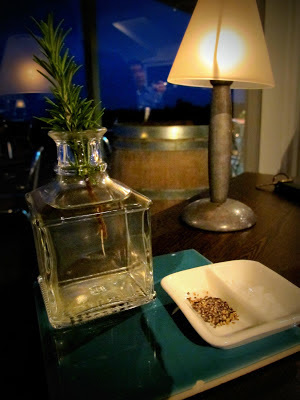 There are so many places in Mornington Peninsula with great reviews and I wish I could go to every single one of them. But there's only so much space in our tummies, and also not to forget, a budget to take into account. And of course, Max's Restaurant. The restaurant manager seated us by the window to supposedly enjoy the stunning view of sunset, but instead we were greeted by a thunder storm. It was only 6pm, but the sky was pitch black and the rain was pouring with the occasional roar of thunder. For entree, I had the lightly dusted calamari, served alongside daikon and apple salad with citrus and mustard seed dressing. 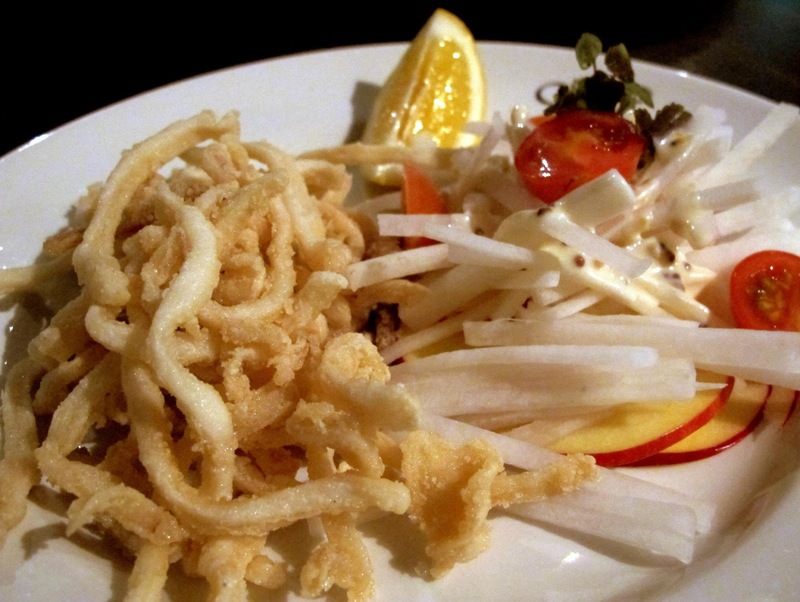 The salad was light and refreshing to start with, and the calamari tasty with a nice crisp. The Boyfriend opted for the soup of the day which was pumpkin soup with sour cream. I did not take a picture of it, but I do remember the Boyfriend saying it was good. It has a hint of sweet chilly, and the sour cream did add a nice flavour to the soup. Not your typical pumpkin soup, that's for sure. 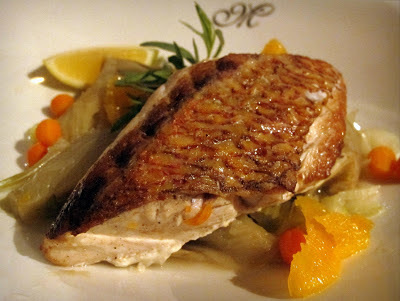 I tried convincing the Boyfriend to go for the beef, but he insisted on getting the grilled fillet of snapper served atop orange glazed fennel and tarragon fish broth. The snapper was very well-grilled I have to admit, but there wasn't much flavour. I'd say it's a healthier option, for those wanting a lighter main. "Beef or pork? Pork or beef?" I had that silently playing at the top of my head on repeat whilst staring at the menu undecided on my main. It wasn't until the wait staff came to take our order, I made an impulsive pick. "I'd go for the pork please." I have no regrets. 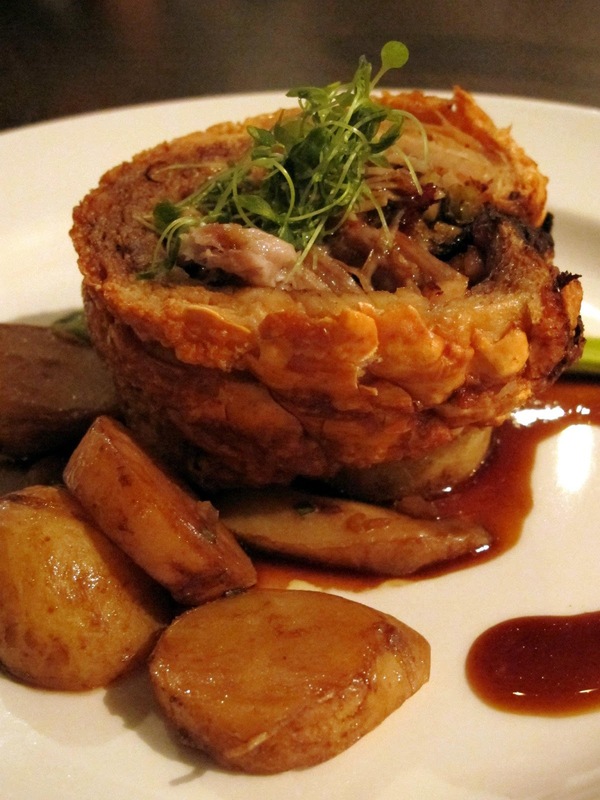 The rosemary and garlic stuffed tuscan porchetta, served with braised kipfler potatoes was so good. The skin was crisp to perfection, meat was so succulent and full of flavour... I loved it! I gave the Boyfriend a bite and I secretly wished that he would regret going for the fish. *evil grins* But whilst I enjoyed my pork, I can't help but wonder how good the beef could have been. While I was happily rubbing my food-baby belly after such a heavy indulgence of porkie goodness, the wait staff appeared with the desserts menu. 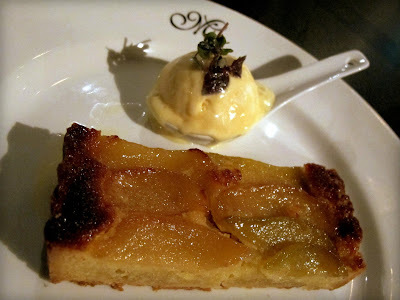 The spiced pear and frangipane tart, served with maple syrup parfait was lovely, but nothing to shout about. There wasn't a WOW factor; it was the type of tart you could get from your local bakery store. 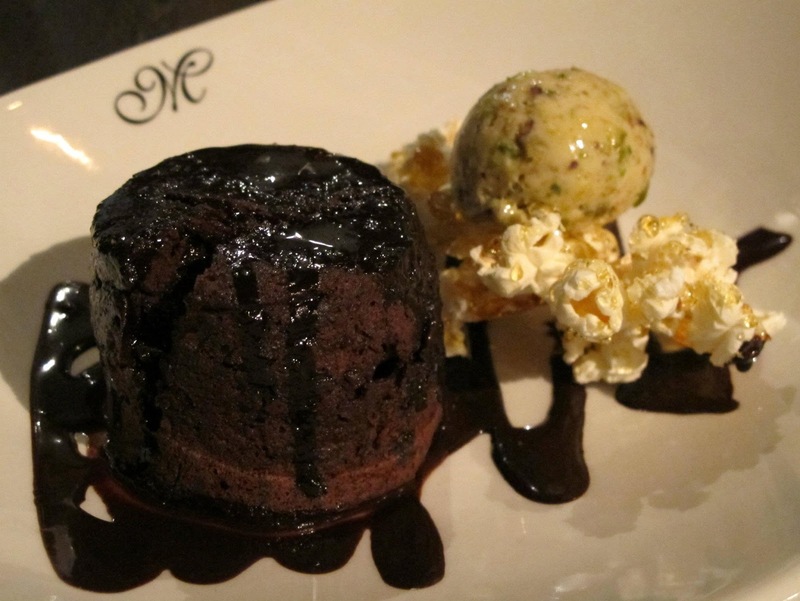 We also had the drunken chocolate pudding served with warm fudge sauce, pistachio ice cream and salted caramel popcorn. We took a bite each, and left it as is. Based on my amateur baking experience, I reckon it was slightly way over-baked. Being a sweet tooth, I always look forward to desserts regardless of how full I already am. I always expect to end my meal with a bang! So, there is no doubt the food snob, as the Boyfriend labels me, was disappointed. But overall, I'd say it was a good meal and I would still recommend that you give Max's a go if you happen to be down at Red Hill. After all, Mornington is only a short hour and a half drive away from Melbourne. We (or more like the Boyfriend) paid $80 per person for our meal. It is usually $75 for 3 courses, but there is an additional $5 fee on public holidays. Good news is that Max's Restaurant is open 365 (or 366) days a year, even on Christmas. I would highly recommend you to book ahead because you don't want to turn up and have no table! I'm not sure if I will return, but if I do, it will only be for the beef that I did not have the opportunity to try. And I'd be skipping dessert. the pudding does look dry. Shellie, but your beef looks SOOOOOOOO good!